So, your dog is standing in front of you, appearing to be on his tiptoes and is sort of hunching his rear end. He begins to show weakness when he gets up and can no longer jump onto your cozy, warm bed. He’s your heart. Your love—and you’d do anything you could to help—if you knew how. So you’ve been feeding him the “most popular kibble” food since he was just a pup and he scarfs it down in no time. But he’s starting to get a little bit chubby and your vet is getting on your case about it. You argue that you “only feed ________ a day.” You sulk away. You end up returning to said vet later because the pain and discomfort seems to be getting worse. Getting more exercise is not going to change anything since it just causes more pain. And guess what? He’s getting more overweight as a result—now there’s MORE weight on those sore joints and you are stressing out at this point. You seem to be going backwards in progress. Your vet may even prescribe a pain meds. But remember, “the animal that takes medicine must recover twice: once from the disease and once from the medication.” Wm Osler, MD. So your dog has side effects you hate, and eventually, the meds don’t seem to be working. You are so very frustrated at this point. As a breeder who talks to people every day about their pets (not bred by myself or mentored by me) and hears this story over and over…same things, different names. Feeding kibble robs dogs of proper forms of dietary calcium needed for strong muscles and bones. “The trans-fatty acids found in kibble that are generated during the cooking process causes them to carry more water weight,” according to Dr. O., DVM (Animal Wellness Magazine). He goes on to say that “this water weight which is often times referred to as inflammation, settles wherever water would settling in the depressions lowest to the ground like joint spaces. Along the spine, those areas are closes to the portion of the cord that carries the nerves to the hind end. Eventually, motor function is lost as the fluid builds up along the spinal cord between the dog’s back and spine.” Now you have early arthritis and paralysis from between 4-9 years old, instead of at about 15-18 years old as in a raw/paleo fed dog that will live into their 20’s. Nerves also need the right kind of calcium (dietary form, not sprayed on or added as in kibble) for the brain to be healthy as well. No exercise will strengthen muscles in which the nerves are not communicating properly. This is why the rehab after the ACL surgery your dog just had didn’t work. The only fix is a diet that is species-appropriate for your pet, is easy to digest, full of live enzymes, has the right forms of whole food vitamins, oils, bio-available calcium (dietary form—food form_), and minerals to form a complete and balanced diet your pet was designed to eat in order to thrive. Can pets survive on kibble—yes, they can ‘survive’ …but American pets are surely NOT thriving!!! (and because they are merely surviving we think they are doing well on kibble—but our vet bills and health issues say otherwise) This raw/paleo diet will consist of real meat, organ meat, and ground bone, mimicking what your dog would eat in the wild—its ancestral diet. Safely formulated by holistic veterinarian, Dr. Ian Billinhurst, DMV…who literally wrote the book on raw diet for pets. This kind of diet decreases inflammation, contains chelated vitamins and minerals (bonded to proteins, for instance, so they are more absorbable)—something you know you heard something about. Or maybe this is the first time! Congratulations on reading this far—it may be the best thing you ever did for your pet. You are one of the many Americans finally catching on to what Australians and Europeans have known for ages about a raw/paleo, species-appropriate diet for their pets—and their dogs are thriving as a result and living into their 20’s. Raw diet will also keep your dog from diseases and developmental problems. 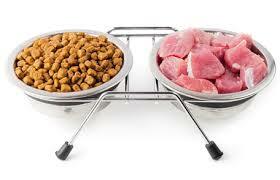 The money you save on vet bills and medications will more than make up for the cost of a raw diet. And your pet will be around at least a decade longer to be your friend and companion. And that—is PRICELESS! them.So which should I feed them?